We can hardly believe it’s been two years since we opened the doors to our new location on Blackfoot Trail! To celebrate a truly fantastic two years, we partnered with The Silk Road Spice Merchant to create a limited edition custom spice blend that can be used on wide array of meat, poultry, and vegetables you can find here at the market. It’s also great in soups, stews, and pastas. Call it all-purpose, we call it fantastic. Inspired by Scarborough Fair, it’s made up of parsley, sage, rosemary, and thyme. As well as, sea salt, pepper, lemon peel, garlic, marash chilis, freshly ground coriander, and citric acid. 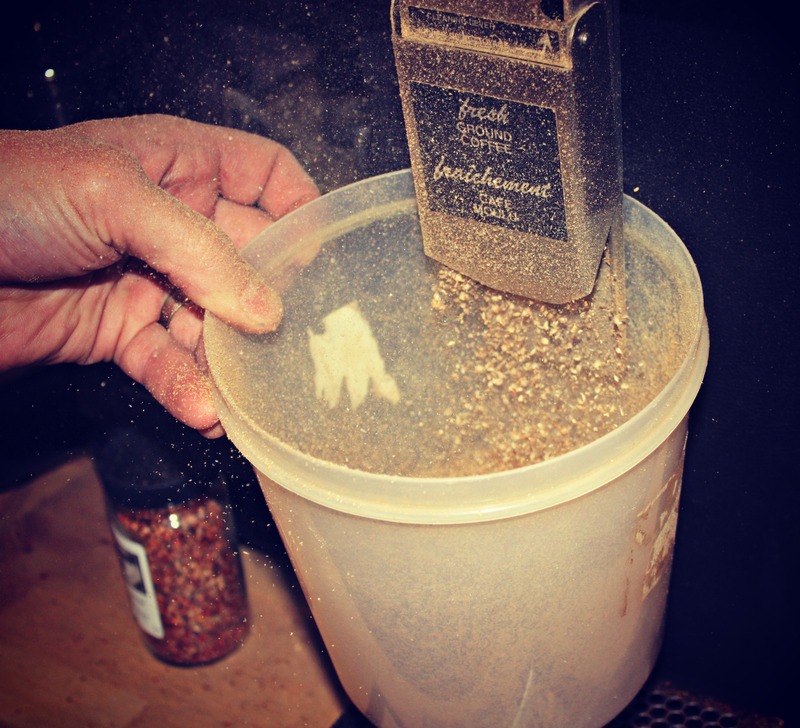 On Saturday, April 20th and Sunday, April 21st we will be holding a contest for 200 customers to win a jar of our limited edition spice blend. And! One lucky guest will be awarded $100 in Calgary Farmers’ Market Bucks! For all entry details, check out our website or our Facebook page. And in case you were wondering just how fabulous the spice is, we have an easy Roast Chicken recipe that is sure to impress. 1 Litre of Chicken Stock from The Stock & Sauce Co.
Take the chicken out of the fridge 30 minutes before it goes into the oven. Preheat your oven to 475°F. There’s no need to peel the vegetables, but you can if you’re a stickler – just give them a wash and roughly chop them. Leave the potatoes whole. Break the garlic bulb into cloves, leaving them unpeeled. Leaving them in the skins will give you sweet, savory little pockets of roasted garlic yum that can be squished out into potatoes if you’re mashing them, onto the chicken, or even tossed in with the roasted veggies. Toss all the vegetables, potatoes, and garlic in a little olive oil, salt & pepper, and a sprinkling of the Calgary Farmers’ Market Anniversary spice, and the juice of half an orange. Pile everything into the middle of a large roasting tray (preferably with a bottom rack). Pour 1 – 2 cups of chicken stock into the pan; the entire bottom of the pan should be covered with liquid. *If you prefer baked potatoes and are looking for a neat way to bring something new to the table, try the accordion potato! *We pop them in the microwave for 12 minutes before slicing and finishing them in the oven so the inside stays moist and fluffy while the outside crisps up. (Be sure to pierce potatoes, toss them in olive oil and salt & pepper, place in a glass bowl, and cover with a damp cloth before microwaving). Drizzle the chicken with olive oil or rub all over with softened butter. Season well with salt, pepper, and the Calgary Farmers’ Market Anniversary spice. Carefully prick the lemon all over using the tip of a sharp knife. Put the lemon inside the chicken’s cavity with half of an onion and half a dozen of the prepped garlic cloves. Don’t be afraid of this simple task, it’s as easy as tying your shoes. And it will ensure even cooking which means you’ll have a killer chicken to present to your friends and family. Here’s a straight-forward video on how to truss a chicken. Place the chicken on top of the vegetables in the roasting tray and put it into the preheated oven. Turn the heat down immediately to 400°F and cook the chicken for about 1 hour and 30 minutes; the juices should run clear when pierced and the legs move easily. If you’re a little on the nervous side and you prefer to use a meat thermometer, the temperature should read 165° before resting. After 30 minutes, baste the chicken and veggies; baste every 15 minutes thereafter. Add more stock as the pan runs dry. When cooked, take the pan out of the oven and transfer the chicken to a board, cover it with a layer of tinfoil and set it aside to rest while you’re taking care of the rest of the veggies and whipping together your gravy (about 15 minutes). Carving a chicken really doesn’t need to be scary, it’s actually quite easy. Here’s a great video if you need some tips. Make sure to remove any string from the chicken before you start. Squeeze the deliciously sweet roasted garlic into the bowl with the roasted potatoes. Add a dollop of butter, a splash of milk, and salt & pepper; smash away. Pop it back in the oven (which is now off) to keep warm. Arrange roasted veggies on a serving platter and place in the oven with the smashed potatoes. Now, let’s make the gravy. 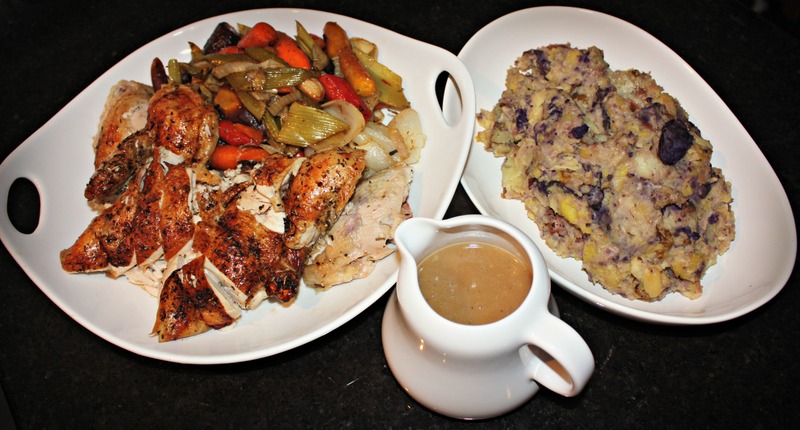 Some people can’t live without gravy, especially if you choose to pluck the fingerling potatoes and garlic out of the pan to make roasted garlic smashed potatoes – you can make a quick gravy by using the remaining stock. Remove any chunks from the pan and pour all remaining stock (from the roasting pan and whatever you didn’t use up from The Stock & Sauce Co.) into a pot. Place the pot directly onto the stove on a medium heat. Adding flour to the stock is essentially what makes a gravy, you can do this two ways: 1. Stir a couple of tablespoons of flour with a little chicken stock until thickened, and slowly whisk into the pot on the stove. Or, 2. Sprinkle the flour directly into the stock and whisk vigorously to prevent clumps. The choice is yours. Now, here’s the trick to making an outstanding gravy: taste it. Yup, you heard it, taste taste taste. It seems odd to say, but most people forget to taste their food as they go. So, add more salt, pepper, or spices if you feel the gravy needs it. And, if you feel like this just isn’t your cup of tea, The Stock & Sauce Co. makes a mean ready-to-go gravy. 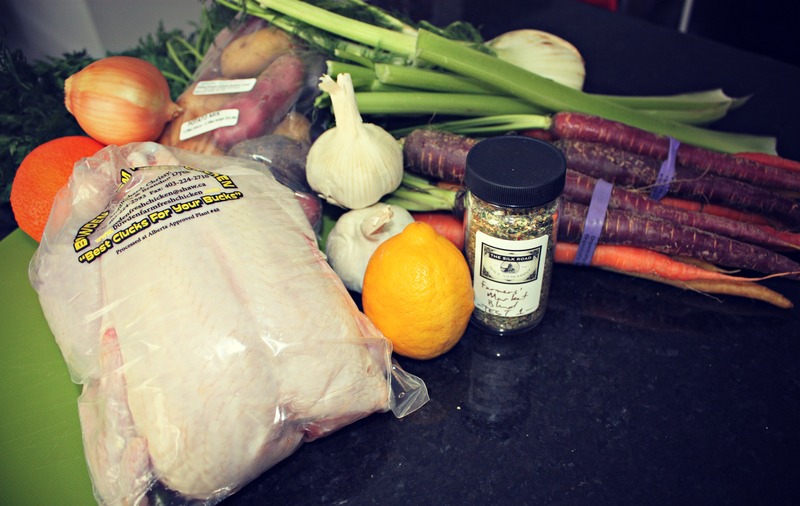 Place carved chicken on a serving platter and surround with roasted veggies. Sit at table surrounded with friends and family. Dig in, and enjoy! Thank-you for helping us celebrate and supporting our new location. It has been an amazing year and we are looking forward to many more. We’re also looking forward to next year when we will be celebrating our 10th Anniversary as the Calgary Farmers’ Market! We can’t wait to celebrate our first decade with you in the summer of 2014. Five years ago, a writer and a nurse started experimenting, researching, sourcing, smelling, testing, and tasting. Colin Leach and Kelci Hind decided it was time Calgary had a local specialty go-to spice shop that would serve as a place to inspire, excite, and invigorate the senses. It only takes one step into the little shop in Inglewood to be transported, whisked away into the possibilities of plate and palate. 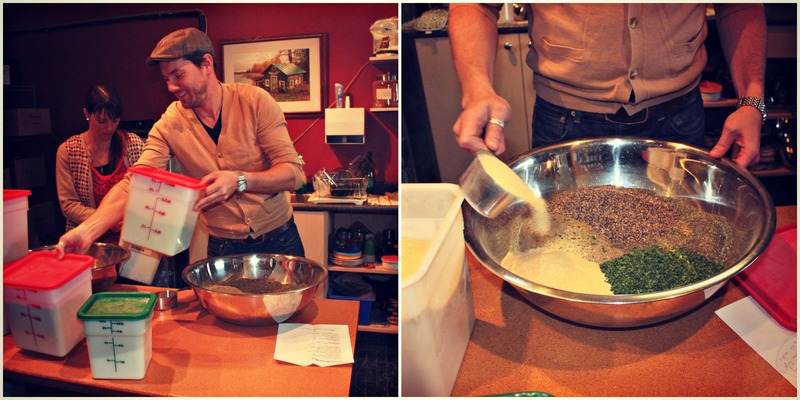 A list of 25 carefully selected blends sold online first, then a small location at the Calgary Farmers’ Market in the Currie Barracks, and now a shop at the new Calgary Farmers’ Market location and a bustling shop in trendy Inglewood; Colin and Kelci aren’t just specialists, they’re artisans. 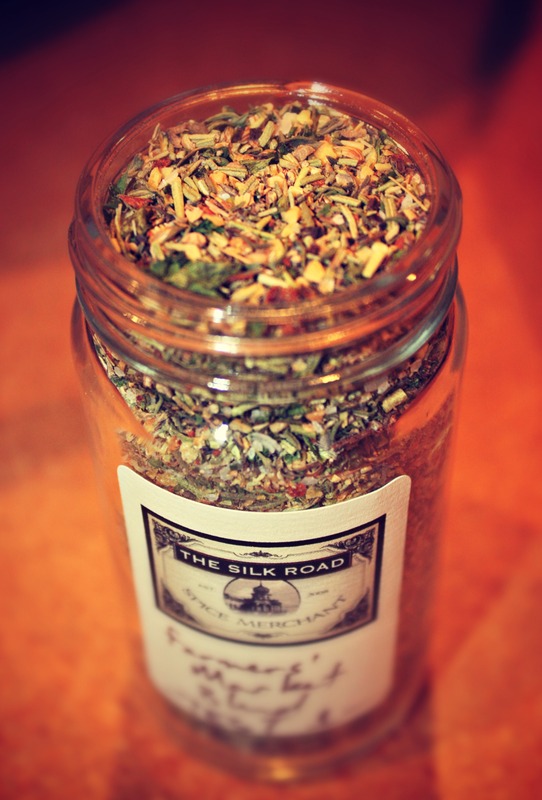 The Silk Road Spice Merchant carries over 200 individual spices and 85 blends. 86 if you count the custom blend they made for the Calgary Farmers’ Market upcoming anniversary! Inspired by Scarborough Fair: parsley, sage, rosemary, and thyme are the beginnings of the Calgary Farmers’ Market custom blend. All blends are handmade and bottled in the Inglewood shop. Even our own Amanda Bonner, Director of Marketing, got her spice on. The signature spice for the upcoming anniversary of the new Calgary Farmers’ Market location includes: parsley, sage, rosemary, thyme, sea salt, freshly ground pepper, garlic, lemon peel, freshly ground coriander, marash chilis, and citric acid It’s perfect for pretty much anything you’ll find at the market! Everyone, from pros to amateurs, can find the rare, basic, or unique spices they need to create an outstanding dish. And their handmade blends are always fresh, aromatic, and flying off the beautiful antique shelves. Requested from Nunavut to Australia, The Silk Road Spice Merchant hasn’t just made a name for themselves in Calgary, they’re taking the world by billowing, aromatic clouds of freshly ground spice-storm. Want to get your hands on a jar of this limited edition custom anniversary blend? To celebrate, we will be launching a contest for our customers to win a jar! All we ask is that you share an anniversary card, drawing, or letter describing what you love about the market. We will have 200 jars to giveaway to all the lucky customers over the anniversary weekend: April 20th and 21st. All submissions will be posted at Customer Service. Of the 200 entries, we will select our favorite and they will receive $100 in Calgary Farmers’ Market bucks. *Please submit off all cards and entry forms at Customer Service.